LOS CABOS, Mexico -- Top business executives are urging world leaders to show more urgency in addressing economic malaise or risk an even deeper global crisis than in 2008-2009. CEOs and senior executives from about 350 companies, including Nestle, Zurich Insurance Group and Walmart, pushed leaders at a Group of 20 summit in Mexico to take firm measures to lift the economic gloom. Jean-Guy Carrier, head of the International Chamber of Commerce business lobby group, said the economic uncertainty was affecting companies "in quite a dire way." "For the people we talk to, small and medium-sized or large companies involved in trade, the instability is just scaring them," he told Reuters at the summit on Sunday. "It's having a pretty deleterious effect on the global economy because these companies, a lot of them say we have plans for expansion and plans for investment but we put them on hold ... Replicate this thousands of times in companies across the world and it is one source of investment, growth and jobs which is not happening." 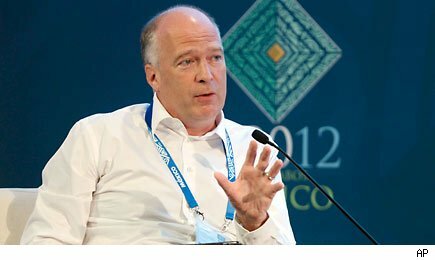 Slowing growth in China and Brazil, fiscal tightening ahead in the United States and a stalling in trade negotiations all meant the economic outlook was already tougher than it was in 2008, he said, calling for G20 countries to send a signal that they understand the severity of the situation. The ICC gave G20 members a must-do-better score in three of four major areas in a scorecard measuring progress since the G20 became a key global policymaker in 2008, at the height of the financial crisis. The head of the world's biggest wind turbine maker, Vestas , said although there had been no dramatic, 2008-style crash, business conditions have deteriorated since August 2011 when the United States was struggling with budget negotiations and was downgraded by Standard and Poor's. "Last week, I spoke to some of the largest pension funds in the world, who are very interested in making infrastructure investments, but they are concerned about doing investments because of regulatory uncertainty," CEO Ditlev Engel said. "If people are holding back, it becomes a self-fulfilling prophecy." Vestas itself is struggling with one aspect of U.S. budget policy: the decision to let a tax credit for renewable energy expire at the end of 2012. The company says it may have to cut 1,600 U.S. jobs, almost half its U.S. workforce, as a result of the change, with a decision due in the third quarter. It also announced plans in January for 2,335 job cuts in Europe. McGraw-Hill Companies chief executive Terry McGraw said a clear signal from the G20 that countries would pull together to tackle the problems, as they did in 2008 and 2009, would help reassure the business community. "I hope that the signals from this G20 will be 'what we were doing is not working and we are going to change it'," said McGraw, whose conglomerate includes ratings agency S&P. Carrier from the ICC said it was crucial for G20 countries to bolster the resources of the International Monetary Fund so that it can help out countries hit hardest by the crisis. Mexican President Felipe Calderon said on Saturday it was possible extra IMF funding would exceed the $430 billion agreed on in April but Brazil, China, India, Russia and Mexico itself have not yet committed to specific sums. "If they actually come to an agreement to ... bring the level of funding up, that's money that's talking, it's not just a promise," Carrier said. "This is why the G20 exists. No single country can deal with this by itself." NEW YORK, June 18 (Reuters) - The Nasdaq advanced on Monday, propelled by a rally in Apple and other big-cap tech stocks, but fears Europe's debt crisis is in danger of worsening limited broader gains. Positive analyst comments lifted both eBay, up 4.5 percent to $42.49, and Groupon Inc, up 10.8 percent at $11.15. Apple Inc accounted for about half the Nasdaq's rise, climbing 2 percent to $585.78. The S&P eked out a slight gain as it bumped up against its 50-day moving average around 1,347 while the Dow ended lower. A weekend election victory by pro-bailout parties in Greece removed one headwind facing the euro zone. But rising bond yields in Spain and Italy reinforced views that Europe has yet to control its debt crisis. The election "wasn't a game changer and does little to alleviate the larger issues that remain in Europe," said Mark Luschini, chief investment strategist at Janney Montgomery Scott in Philadelphia. But there were conflicting signals about the way forward. The leader of New Democracy, Antonis Samaras, pledged his commitment to Greece's international bailout package, but also said there would have to be "some necessary amendments." Meanwhile, Germany's chancellor, Angela Merkel, said any lo0sening of agreed reform pledges would be unacceptable. The election results also offered little reprieve from contagion concerns as yields on both Italian and Spanish bonds rose, with Spain's 10-year yield climbing above the 7 percent mark at which other highly indebted euro-zone nations were forced to seek bailouts. European authorities have already agreed to a 100-billion-euro ($125 billion) rescue for Spain's troubled banks. Market participants were also reluctant to take bets ahead of the U.S. Federal Reserve's two-day policy meeting, with investors keen to see if the Fed will announce new stimulative measures in its policy statement at the meeting's close on Wednesday afternoon. "Without knowing what will come from the Fed meeting on Wednesday, the market doesn't want to get ahead of anything," Luschini said. The Dow Jones industrial average was down 25.28 points, or 0.20 percent, at 12,741.89. The Standard & Poor's 500 Index was up 1.94 points, or 0.14 percent, at 1,344.78. The Nasdaq Composite Index was up 22.53 points, or 0.78 percent, at 2,895.33. Last week, U.S. stocks rallied on Thursday and Friday on news that central banks of major economies would take steps to stabilize markets if necessary after the Greek vote. As a result, much of the bullish bias of the election news was priced in. The S&P 500 rose 5.1 percent in the last two weeks. An index of energy shares fell 0.8 percent on Monday, with the sector ranking as the S&P 500's worst performer. U.S. crude futures dropped 1 percent after falling for six of the last seven weeks. European shares erased early gains and closed flat, with the FTSEurofirst 300 index up 0.04 percent. Also in the technology sector, Facebook struck a deal to acquire Face.com, whose facial-recognition technology has been in use on the social network. Facebook shares jumped 4.7 percent to $31.41, taking its cumulative gains in the last three sessions to about 16 percent. DSW Inc plunged 11.3 percent to $52.13 after the footwear retailer gave a quarterly earnings outlook below analysts' expectations. Volume was light, with about 5.78 billion shares traded on the New York Stock Exchange, the American Stock Exchange and Nasdaq, below last year's daily average of 7.84 billion. About 57 percent of stocks traded on the New York Stock Exchange closed higher while the number of advancers and decliners on the Nasdaq was about even. Crisis-weary investors scoffed Monday at what had appeared to be a hopeful turn in the European debt crisis: a victory for pro-Europe parties in a Greek election. U.S. stocks were little changed, and borrowing costs for Spain surged to alarming levels. Investors appeared fed up with policy makers' inability to resolve a crisis that has bedeviled markets for more than three years. Leaders of the most developed countries are meeting in Mexico to discuss the crisis and the slowing global economy. "Even though we avoided the worst-case scenario in Greece, the crisis has entered a new and dangerous phase, and it doesn't end with Greece," said Michelle Gibley, director of international research at the Schwab Center for Financial Research, a division of the Charles Schwab brokerage. U.S. indexes opened lower then drifted between modest gains and losses. Homebuilders rallied after a measure of confidence among U.S. builders rose to a five-year high. Spanish borrowing rates spiked Monday above levels that forced other countries to take bailouts, a sign that bond investors fear Spain will default on its debts. The Dow Jones industrial average closed down 25.35 points, or 0.2 percent, to 12,741.82. The Nasdaq composite index rose 22.53 points, or 0.8 percent, to 2,895.33. It was lifted by Apple, its biggest component, which rose $11.65, or 2 percent, to $585.78. Rival tech titan Microsoft unveiled its new tablet computer after the market closed. Dubbed "Surface," the gadget will compete with Apple's market-dominating iPad. The Standard & Poor's 500 index rose 1.94 points, or 0.1 percent, to 1,344.78. Of its 10 major industry categories, only financials and energy stocks fell. Banks would be hit hard if the European crisis spun out of control. Energy companies followed oil prices lower. On Sunday, Greek voters elected a party that wants to continue a program of international bailout loans that are conditioned on painful budget cuts. Traders had fretted for weeks that a radical leftist party would prevail and reject Europe's unpopular bailout plan. The next step, traders feared, would be Greece's dropping the shared currency. Anxiety over a Greek exit was so pronounced that many expected bank runs on Monday if political anti-bailout parties had won the election. Yet Greece's situation remains precarious. The anti-bailout party got a big chunk of the vote. There's also no guarantee that the winners will be able to form a government. Elections a month ago failed to produce a governing coalition, leading to Sunday's do-over. Many had expected stocks and other risky investments to rally on relief that the conservative party won. But the broader scope of Europe's financial burdens soon overshadowed whatever breathing room the election provided. Safe investments rose and riskier ones fell as traders continued their long vigil for a more permanent solution in Europe. Leaders there are considering a centralized system of bank regulation and deposit insurance to complement proposals of closer economic coordination. "It doesn't appear that any lasting solution is a possibility any time soon," Schwab's Gibley said. "Until we get some kind of coming together, volatility is likely to continue." Attention shifted Monday toward Spain and Italy, both of which will require international help if they can't convince bond investors that their finances are sound. Benchmark stock indexes closed down 3 percent in Spain and 2.8 percent in Italy. The yield on the 10-year Treasury note fell to 1.58 percent from 1.63 percent earlier Monday as demand increased for low-risk investments. The yield on Spanish 10-year bonds jumped as high as 7.18 percent, the highest since Spain joined the euro. Only a week ago, Europe unveiled a massive bailout of Spain's banks intended to reassure investors about the nation's finances. Greece, Ireland and Portugal needed bailouts after their borrowing costs rose above 7 percent. It looks like tiny Cyprus will need a bailout as well. The Greek election "should be seen as a significant net positive for markets, but markets don't always react in a rational manner," said David Kelly, chief global strategist for JPMorgan Funds. The ISE Homebuilders index rose 34 cents, or 3.5 percent, to $9.98. Lennar, PulteGroup, D.R. Horton, Toll Brothers and Hovnanian Enterprises all rose strongly. Giant military contractor SAIC fell 38 cents, or 3.1 percent, to $11.86. The Defense Department said Friday that SAIC had lost its biggest contract to Lockheed Martin, a $4.6 billion deal to run the department's global network. Energy prices, which are sensitive to investors' expectations of future economic growth, fell. Benchmark crude for July delivery slid 76 cents to $83.27 per barrel in electronic trading on the New York Mercantile Exchange.